Rickenbacker Violins specializes in making and restoring violins, violas, and cellos. 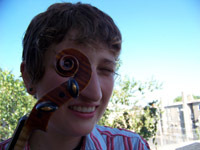 Owner, Kate Rickenbacker, is a graduate of the Chicago School of Violin Making. She earned seven years of shop experience before relocating to the mountains of Western North Carolina to open up her own violin shop. Kate makes instruments using the tools and traditions established by the old masters of the 16th century. Kate applies the same skill to repairing and restoring antique and modern instruments. She believes that if an instrument is worth fixing it is worth doing well. By appointment only. Call anytime and set up an appointment to stop by.